Brivido is Capable of reaching 100 km/h in 5.8 seconds, with a maximum speed of 275 km/h without compromising on-board comfort or space. Aluminium, carbon fibre, and glass are the materials that define the Brivido‘s exterior. The lines of the body, painted in Xirallic pearl lustre red, are sinuous and aerodynamic and accentuate the sporty, elegant character of this latest Gran Turismo from (by) Giugiaro. The windscreen, roof, rear window, and large door windows form a glass dome that lets natural light pour into the passenger compartment. There the occupants are surrounded by an exclusive level of finish and high-technology, whilst they enjoy the surrounding scenery and urban landscapes as they travel. 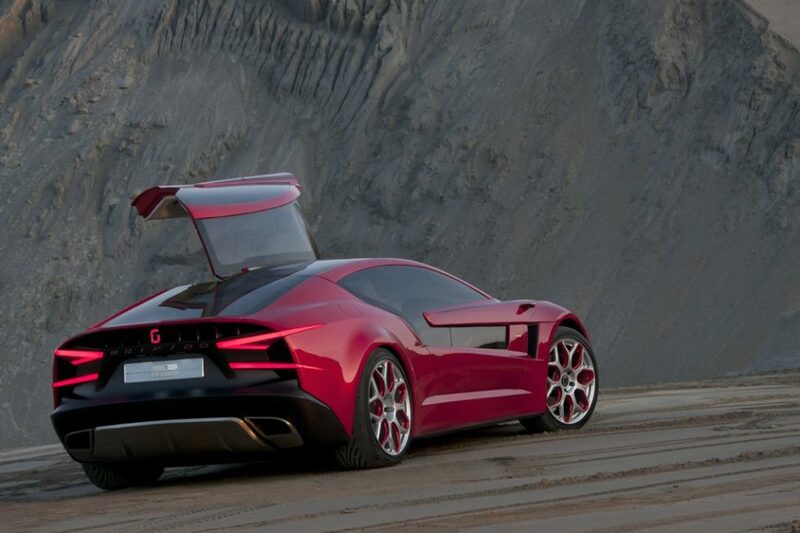 “This is a quest for a genuine four seater,” Giugiaro says, “to offer comfort and visibility, especially for the rear passengers, which are usually sacrificed in this type of vehicle. As always, I’ve tried to offer solutions which can be achieved practically. The inclusion one wide door on each side that rises like gull wings is the only “exotic” concession which makes the Brivido a show car. The rest of the solutions are perfectly applicable for vehicles destined for the market. The rear passengers, specifically, can access their seats without having to duck down or lower the front backrests. Instead they can enter the vehicle easily and naturally”. Visibility is also a watchword on the outside of the passenger compartment as the Brivido showcases real innovation in exterior lighting. Thanks to LED technology, the headlight clusters are not only functional, but also represent a never-before-seen stylistic feature. Extending 2600 mm from the front bonnet, each cluster hugs the sinuous lines of the body and finishes midway along the side panel, at the height of the side door. These clusters thus also act as both sidelights and direction indicators. “For several years now, thanks to new technologies like LEDs,” continues Giorgetto Giugiaro, “even quintessentially functional elements like light clusters have become something more: a distinctive element and a design signature. With these innovative light clusters we are confident that the Brivido will be instantly recognizable even in the total darkness of night”. The side of the Brivido hides a final technological treasure: the side mirrors have been replaced by an innovative system comprising of two cameras which literally emerge from the body. When the control is activated, the wings concealing the two micro-cameras, positioned at the height of the side air intakes, open up 90 degrees and activate the cameras. The camera images are then displayed on monitors built into the steering wheel column.